The forecast for the eurozone economy is now the most favorable in the last seven years, European Central Bank president Mario Draghi said on Friday, adding though that this was not the end of the challenges for Europe. "The economic outlook for the euro area is brighter today than it has been for seven long years. Monetary policy is working its way through the economy. Growth is picking up. And inflation expectations have recovered from their trough,"saidDraghi Friday at an economic forum in Sintra, Portugal. The ECB president urged the eurozone to accelerate structural reforms not just to support economic growth and reduce unemployment, but also to give the ECB the opportunity to ensure price stability. "This is by no means the end of our challenges, and a cyclical recovery alone does not solve all of Europe's problems," said Draghi. It doesn’t solve the problem of structural unemployment in many countries, doesn’t eliminate high-sky debt in many parts of the eurozone, and the institutional set-up of the monetary union still has to be enhanced, said the ECB president. Draghi said at a conference on unemployment in Portugal Thursday that inflation in the eurozone is too low, which marks economic weakness and the people of Europe are frustrated by the lack of growth in the last year. 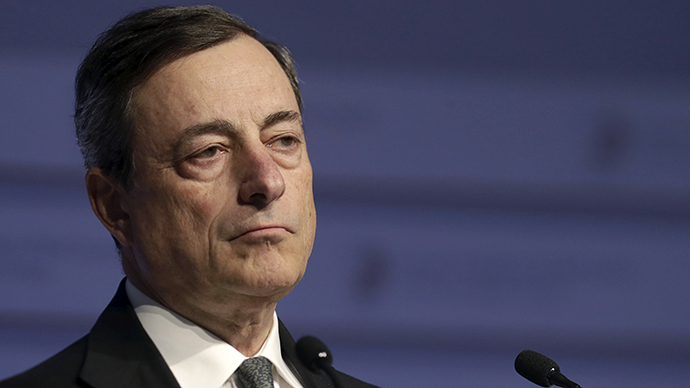 At April’s meeting the ECB kept its benchmark interest rate at a record low of 0.05 percent. ECB deposit rate was left at minus 0.2 percent, the rate on margin loans at 0.3 percent. In March, the ECB began a €1.14 trillion bond buying program known as quantitative easing (QE). In it the ECB buys eurozone government bonds worth €60 billion each month. It is expected the ECB will purchase assets until the end of September 2016. Earlier Draghi said the ECB would continue QE until it sees sustained acceleration of inflation. A senior ECB policymaker Benoit Coeure said on Tuesday that the ECB would accelerate QE in May and June to compensate for lower money supply in the market later in July and August.